On March 17th, in an event largely unnoticed by Canadian media, approximately 200 Canadian Armed Forces (CAF) members deployed to Ukraine finished their rotation and were replaced by a new commanding officer and troops. Operation Unifier (Op Unifier) began in 2015 when Canada joined the Multinational Joint Commission alongside the US and UK. There are currently around 200 CAF members serving in Ukraine with Op Unifier. The situation in Ukraine, now largely ignored by Western media, remains volatile. The current total death toll is over 10,000, and new casualties are reported every week. Despite claims that the war has become a “frozen conflict,” the Ukrainian government rejects this qualification due to incessant attacks, such as on May 18th when the Ukrainian Joint Forces Operations reported that militants had launched 43 separate attacks. The conflict began in 2014 in the wake of massive street protests that ousted pro-Russian President Viktor Yanukovych. Within weeks, unmarked Russian troops seized control of Crimea, which then voted in an unrecognized referendum in favour of annexation by Russia, and armed separatist movements appeared in the Luhansk and Donetsk regions in Eastern Ukraine. The illegal annexation of Crimea is not recognized by the Canadian government. It is important to note that the Canadian government’s support to embattled Ukraine is not only military, but also economic. Global Affairs Canada pledged $ 700 million to help the Ukrainian government with economic development and civil society bolstering. The current commanding officer of Op Unifier, Lieutenant-Colonel (LCol) Fraser Auld, actively shares the work of Op Unifier with the world through social media. A few weeks ago he tweeted about how Op Unifier aims to bring the Ukrainian military up to NATO standards. This is a key factor in the mission, as NATO officially recognized Ukraine as an “aspiring member” on March 10th. Indeed, LCol Auld has been transparent about one of Op Unifier’s primary focuses, stating that “we support Ukraine to reach their goal of NATO compatibility”. Ukraine has aimed to join NATO for some time, but this rapprochement with the West has been actively countered by Russia. Indeed, NATO enlargement into countries that Russia considers part of its “Near Abroad,” or in then-President Medvedev’s words, “regions where [Russia] has privileged interests,” is one of the main causes of the cooling relations between Russia and the West since the early 2000s. Nevertheless, Operation Unifier has already trained almost 7,000 Ukrainian soldiers. Further, Ukrainian news sources have highlighted CAF’s role in the vast improvement of their army’s capabilities since the war began in 2014. Op Unifier focuses on “tactical soldier training,” including explosive device disposal training. This is especially important in the Donbas conflict, as the Assistant Secretary-General for Humanitarian Affairs at the UN remarked in 2017 that Eastern Ukraine was “rapidly becoming one of the most mined areas in the world”. This was tragically demonstrated in April 2017 when a landmine killed an American paramedic working for the OSCE monitoring mission in Ukraine. Other essential training includes ethics, marksmanship, and communications, essential to bringing Ukrainian armed forces up to NATO’s standards of operational efficiency and capability. Another important element, highlighted by a CAF member deployed on Op Unifier, is that of training Ukrainian army officers so that they can eventually train their own troops directly and independently, without need for outside mentorship. LCol Auld has a policy of tweeting and posting on Facebook in English, French and Ukrainian, a move well-calculated to broaden readership to both interested Canadians and Ukrainians, whose lives are directly impacted by Op Unifier’s work. In a country where language is such a contentious issue this decision is important. What is interesting is that the Lieutenant Colonel does not post in Russian. Canada’s important role in supporting the Ukrainian forces was recently highlighted when Russian-language news sources began spreading false reports that three Canadian soldiers had been killed by a landmine in Eastern Ukraine. These rumours were denied by the Canadian Department of National Defence. Operation Unifier is scheduled to continue until spring 2019, and CAF members are likely to replicate their successes in the coming months. Whether the mission will be renewed next year is likely to be a contentious question. 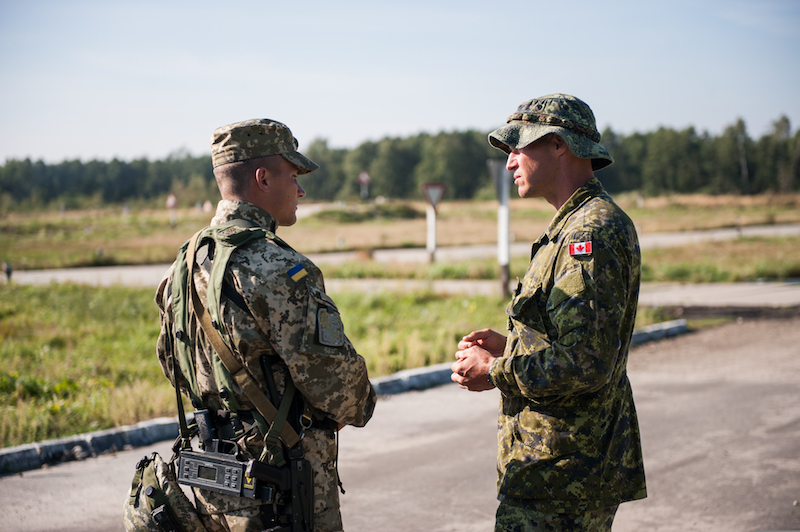 A Canadian Army Combat Engineer Talks to a Ukrainian Military Observer-Controller During a Situational Training Exercise as Part of Rapid Trident 2014 in Yavoriv, Ukraine (2014), by Joshua Leonard via Wikimedia Commons. Public Domain.